In Iowa the nights are cooling down, the corn is almost ready for harvest and pumpkins have shown up at the farmer’s market. I love this change of seasons. Des Moines has an incredible farmer’s market that runs 7am to noon every Saturday and occupies 6 square blocks in the middle of downtown. 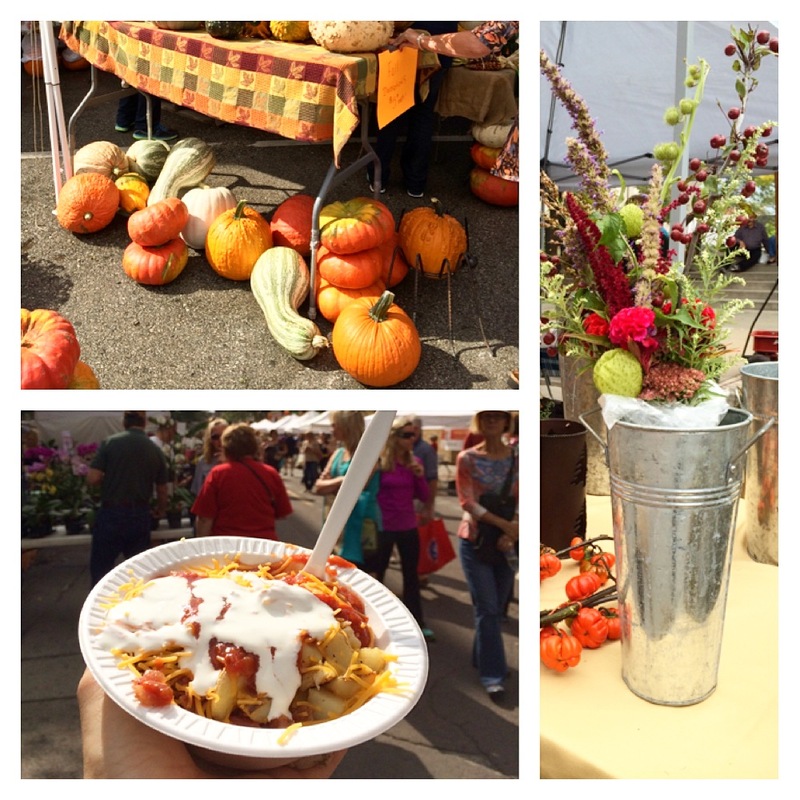 Go for the live music, the seasonal pumpkins and dahlias, a breakfast bowl from Farm Boys Hearty Food Co. followed by mini apple cider donuts and local coffee. All of Des Moines turns out on Saturday morning and the market operates rain or shine. This 4.4 acre park in the middle of Des Moines has 24 sculptures contributed by John and Mary Pappajohn, 2 of Iowa’s leading contemporary art collectors. The park is open until midnight and the curving walkways allow you to take your time exploring. You can download a cell phone tour or you can pick up one of the brochures at the park entrance and give yourself a brief contemporary art eduction as you walk. 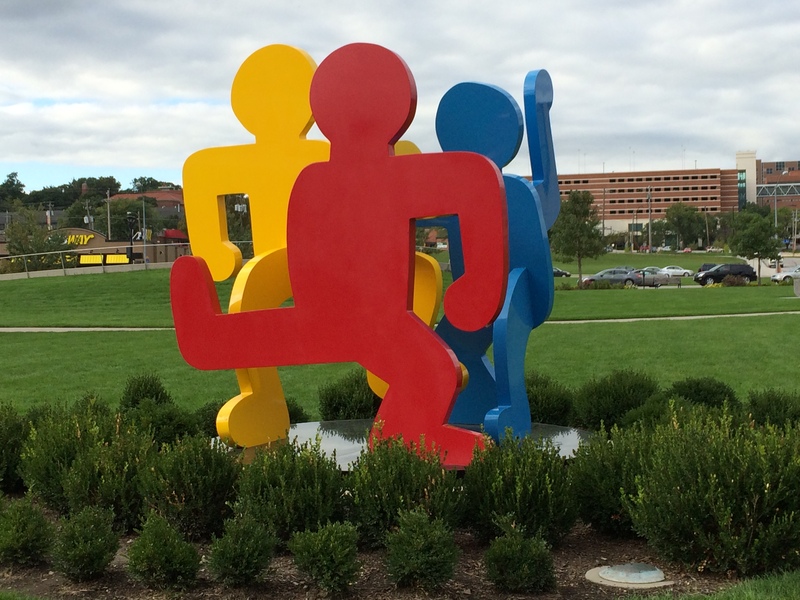 Make sure to walk around all sides of this Keith Haring sculpture, see the famous Nomade from the inside and wonder what it looked like on the banks of the French Riviera, eat your donuts while sitting on this sculpture and see the Des Moines skyline through the legs of the spider. 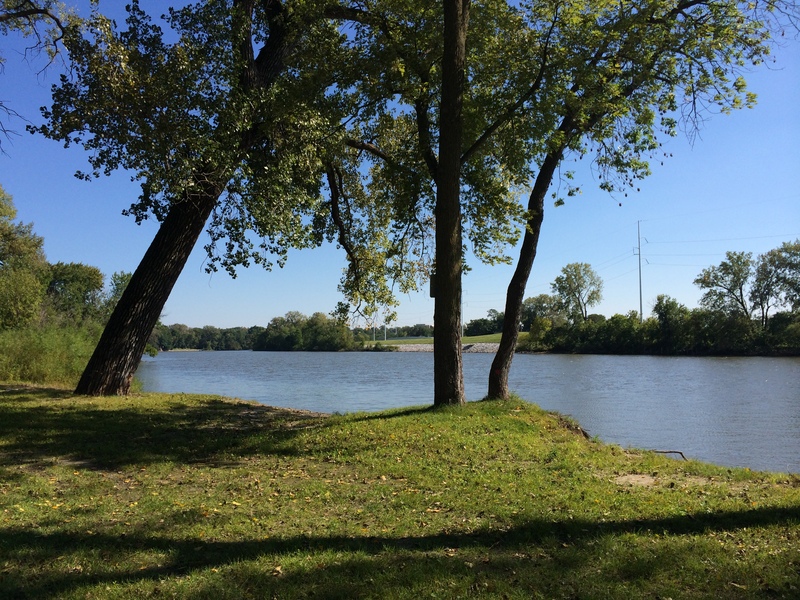 Running trails, a boat marina, tennis courts, picnic tables, a small lake and the Des Moines River all come together in this park. Bring your bike and your tennis racket or just walk alongside the river and enjoy the weather. For lunch you should eat at one of Des Moines most infamous restaurants, Zombie Burger or Fong’s Pizza. 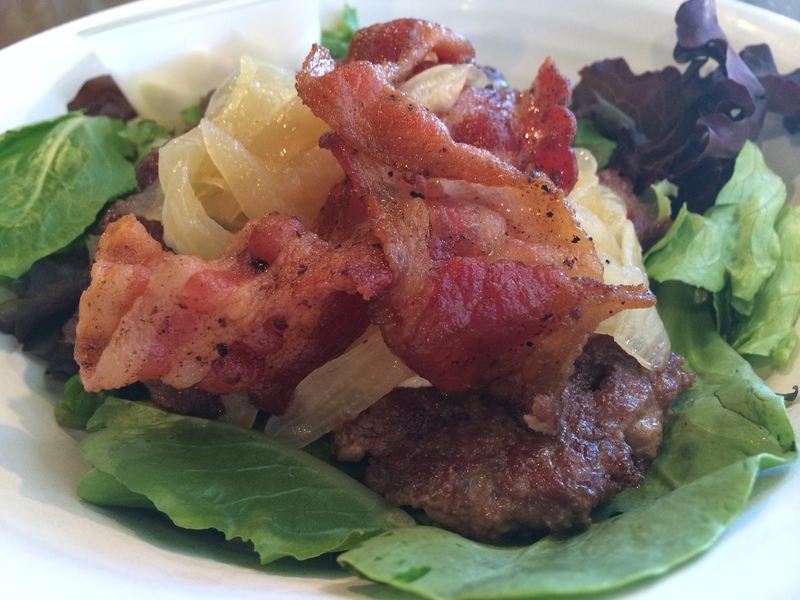 Zombie Burger + Drink Lab has been serving gourmet burgers (not brains…) to downtown Des Moines since 2011. There’s a Zombie burger for every adventurous eater; particularly the Undead Elvis that comes with peanut butter, fried bananas and bacon, Juan of the Dead with a green chili cheese croquette and chipotle mayo and La Horde (above) with bacon, goat cheese and caramelized onions. The burgers are bashed flat on the grill so they’re crispy and cooked through, the mac and cheese shouldn’t be missed (and comes on the burger if you order The Walking Ched) and all their milkshakes are delicious though my favorite is the Zombie Bride Wedding Cake made with yellow cake mix and vanilla ice cream. 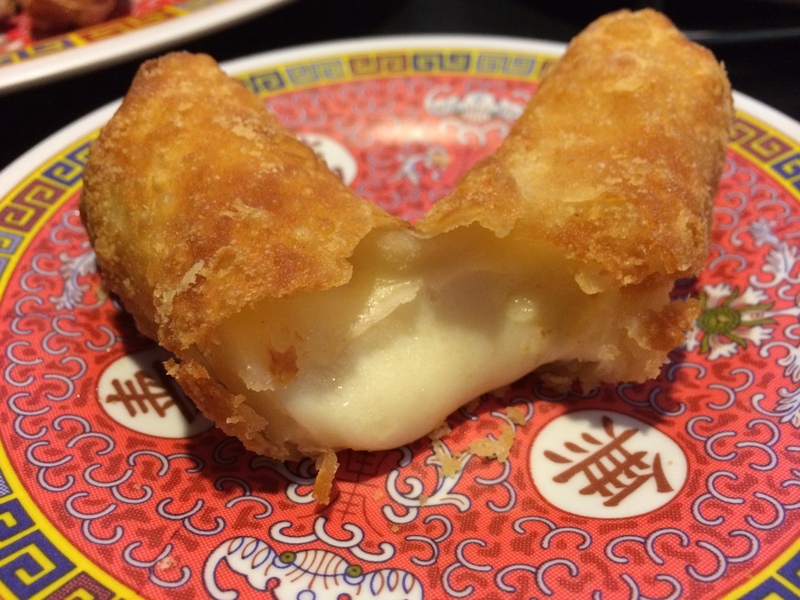 Fong’s Pizza is a pizza parlor married to a tiki bar serving mozzarella egg rolls (above) they call Chinese Cheesesticks and mu shoo pork and kung pao chicken pizzas. It’s a little hipster paradise in downtown Des Moines and the thin crust pizzas are as crispy as a cracker. If you’ve ever wondered how Hawaiian pizza might taste if you went one more step and added kung pao sauce, bacon and green pepper, then Fong’s is the place you’ve been dreaming about. Make sure to try the crab rangoon pizza, chosen by Food Network Magazine as the best pizza in Iowa. 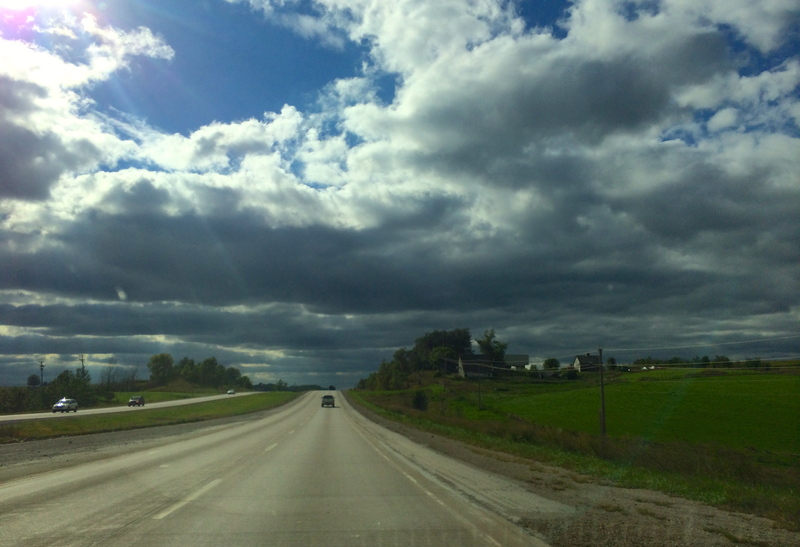 After lunch, take a mini road trip for the afternoon so you can see the Iowa countryside. 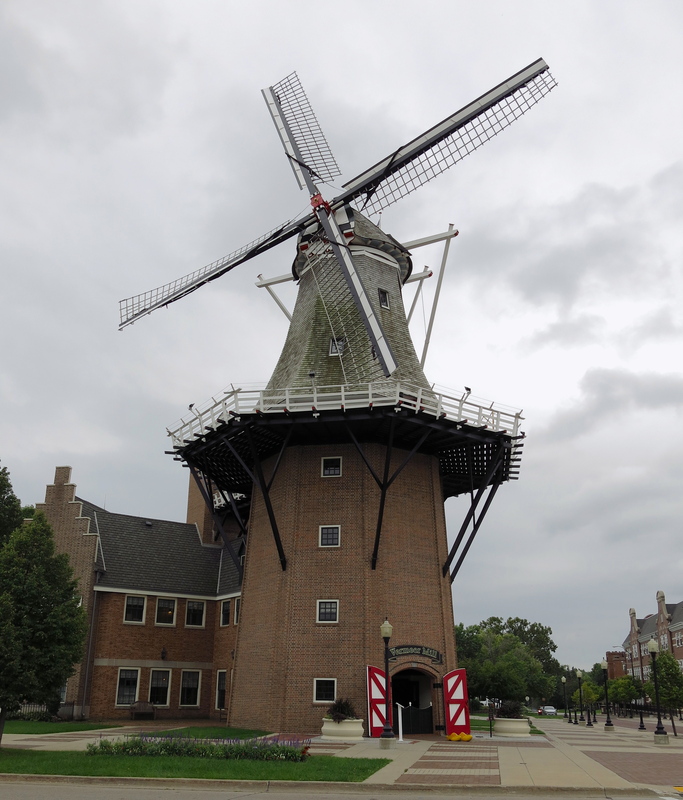 There are a number of interesting destinations that are an hour or so driving distance from Des Moines, one is the little Dutch settlement of Pella. I took a tour of the Vermeer windmill above and was pleasantly surprised and fascinated by the inner gears and wheels, which are all wooden and completely wind driven. This is the tallest working Dutch style windmill in the US and on gusty days they grind grain into flour using only wind power. 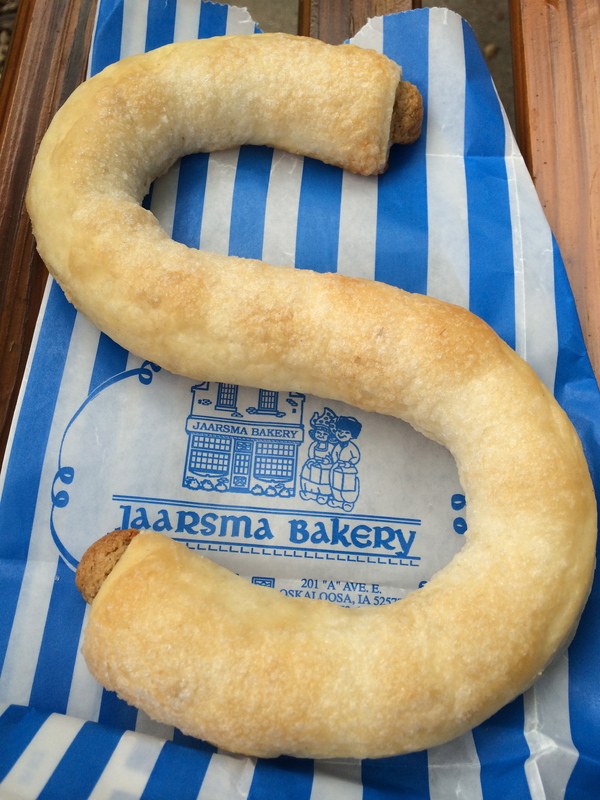 They sell the fresh flour in the gift shop in 2lb bags and also supply the local Jaarsma bakery. The entrance fee for the windmill ($10) includes a self guided tour of the surrounding historical settlement with shops for blacksmithing, cobblers, dry goods, a library etc. I visited on a very slow, quiet Tuesday so I got to poke around all by myself; but I know that during the Tulip Festival in May, for instance, the place is packed and you’ll need a reservation. Get a flaky buttery pasty filled with almond paste called a Dutch Letter and then go by Brew Coffee House for a pour over coffee before getting out of town. 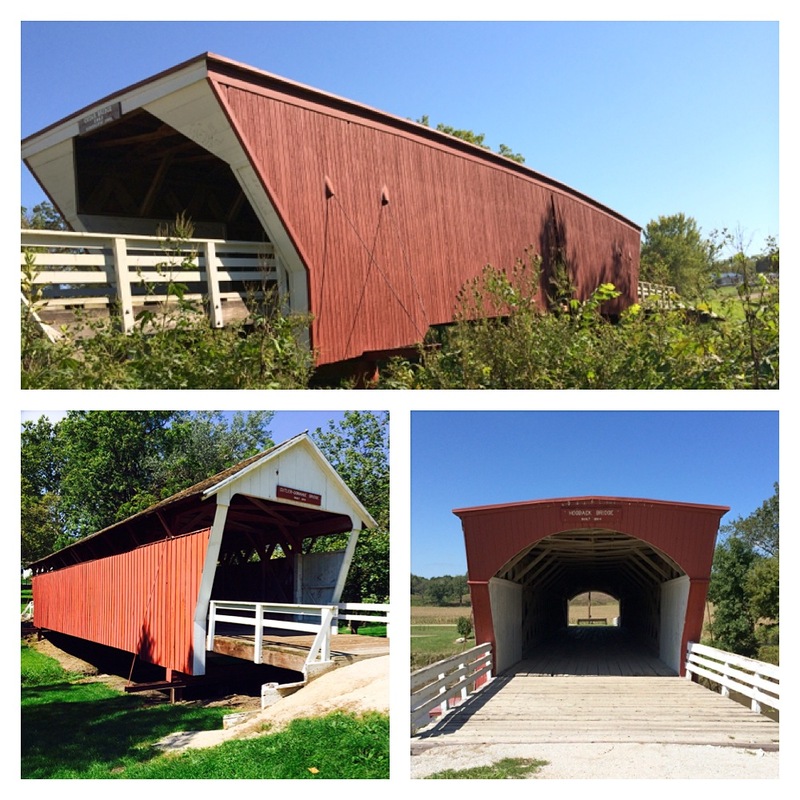 These beauties surround the town of Winterset and were made famous by this book, followed by this movie and then this musical and if you visit in the next couple of weeks, you’ll be right in time for the Covered Bridges Festival in October. The bridges are lovely, especially seen against the fall foliage, but they aren’t always well marked or easy to find. I’d recommend stopping by the Madison County tourist center in downtown Winterset where they’ll give you a map and some route recommendations and you can buy a bottle of Madison County wine. Most of the bridges are only accessed down dirt and gravel roads so plan to take your time. If you get lost, just roll with it. This house museum is extremely small, decorated with reproduction furniture and stuffed with pictures and memorabilia from his 169 films. If you aren’t a serious John Wayne fan I’d skip this stop because it’s only accessed via a guided tour. 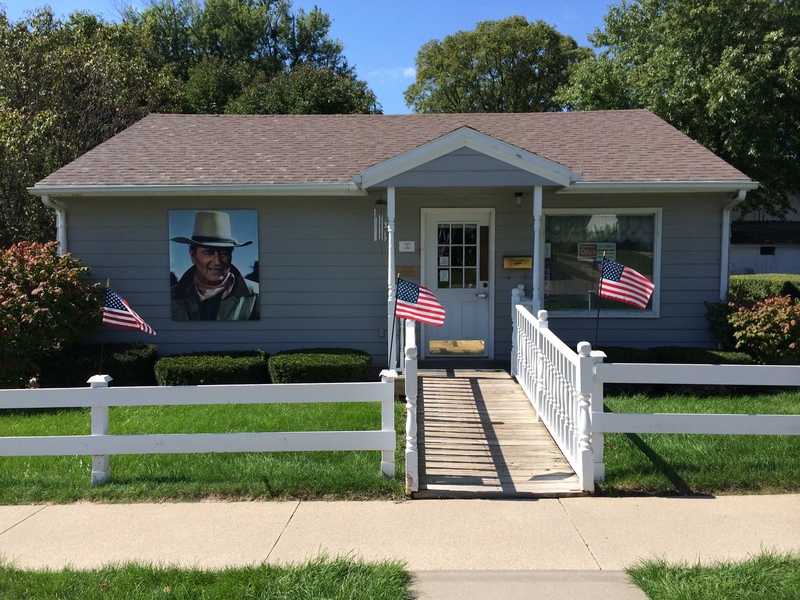 However, there are plans to open a much larger John Wayne museum in Winterset in May 2015. Being able to wander around a larger museum without a tour guide would increase it’s appeal for me. The current house museum costs $7 admission for a guided tour but the gift shop can be visited for free. and try their homemade cobbler. 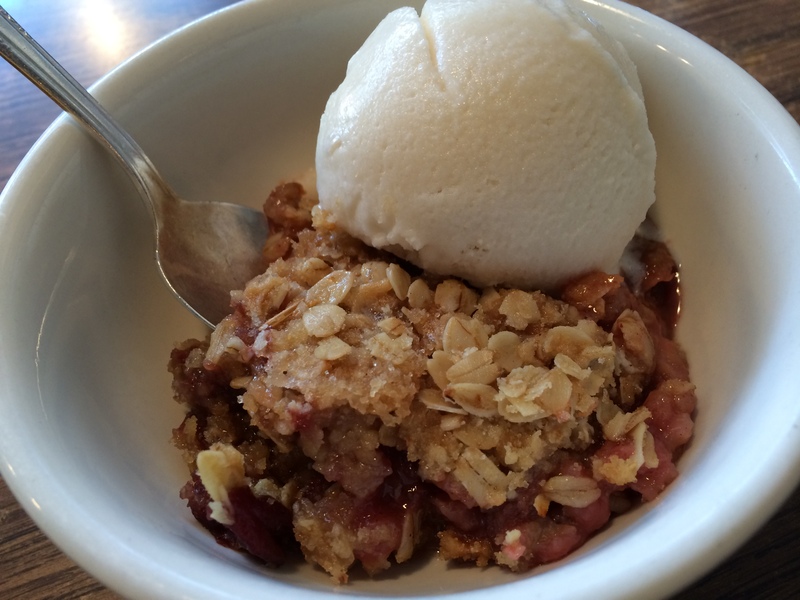 I had the strawberry rhubarb and of course I added ice cream. Of course. It’s the perfect late afternoon treat. 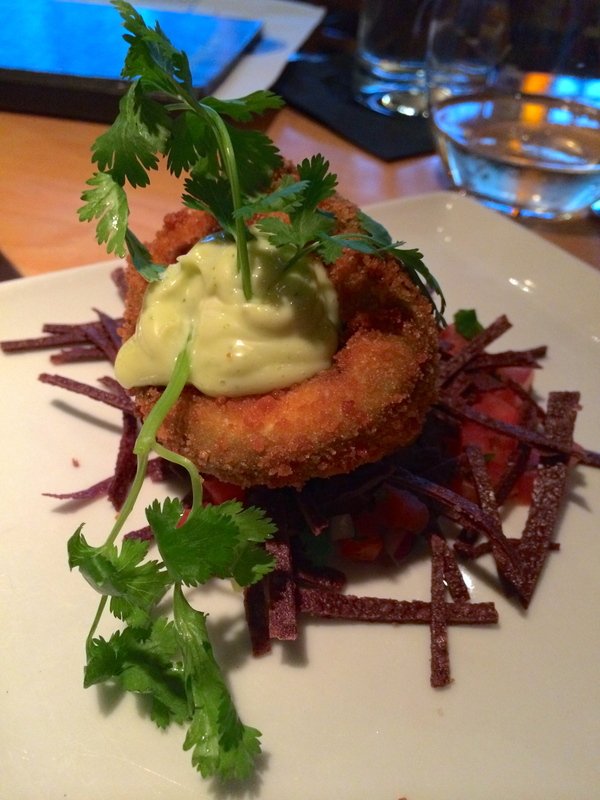 That’s a deep fried avocado with cilantro aioli and it was pretty darn good. Trostel’s Dish promises small plates from around the world, both exotic and familiar, and they do a good job with both. We ordered half the sharing menu and my favorites were this avocado, the havarti shrimp and the beef tenderloin with Maytag bleu cheese. I was not impressed with the tuna poke tacos so I’d avoid them but if you like poutine, you’ll enjoy their duck confit poutine. They’ll also bring you a dessert sampler with a little bit of everything on it. If you roll out of Trostel’s Dish and you need a nightcap, head to El Bait Shop for one last drink on their giant patio. I hope you enjoyed your day in Iowa under that big open Midwest sky! It sure is lovely. This entry was posted in Art, Burgers, Day Trip, Des Moines, Driving, Farmer's Market, Good eating, Iowa, Pella, Pizza, Road trips 2014, Uncategorized, Winterset and tagged Birdland Park, Covered Bridges of Madison County, Des Moines, Dutch Letters, Farmer's Market, I heart the midwest, Iowa, Jaarsma Bakery, John Wayne's Birthplace, Northside Cafe, Pappajohn Sculpture Park, Pella, road trips 2104, Trostel's Dish, Vermeer Windmill, Winterset. Bookmark the permalink. Not all… :) Lots of pumpkins too!